"Ray calls his audience to 'come, watch and take part' and you cannot stay away!" Two different 30 minute displays, each featuring different birds. brings the ancient art of Falconry to the modern age, with a comprehensive and thrilling display, that is guaranteed to thrill audiences of all ages. Ray and Wendy Aliker have been giving professional displays for nearly thirty years and in that time have built up a reputation for giving one of the most sought after and exciting displays on the indoor and outdoor circuit. Filled with audience participation, the display shows the natural attributes and abilities of the birds, how they live, fly and hunt in the wild. Two Falcons from India, flying together in a spectacular, not to be missed, display. 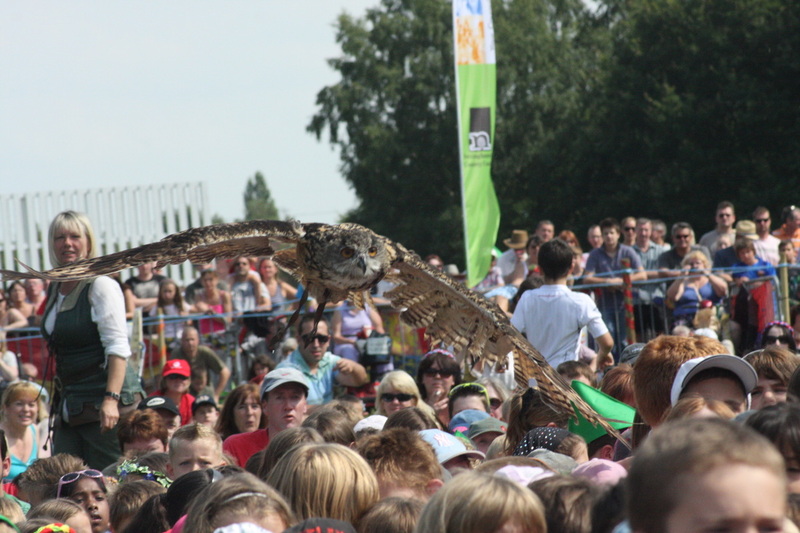 The Barn Owl, hovering high above the crowds, spell binding as it flies’s to the children. The Peregrine Hybrid, estimated at pulling 10g, the fastest living creature on the planet - this one is stunning !!! The widely acclaimed Harris Hawks, intelligent, sociable, showing a range of skills the audience have to see to believe! The Kestrel - the agile little bird we know so well - flying effortlessly for the children. No where in the country can an Eagle Owl be seen at such close quarters, as the audience finds out what it’s like to be a mouse! Lots of birds and lots of audience participation! "The family run Ye Olde Redtail Falconry Display combine their years of experience with amazing audience participation for a truly unforgettable experience!" is one of the most informative, original, refreshing and exciting displays you’ll ever see. The birds are all flown to music, each piece specially chosen to depict the style of flight and heighten the enjoyment of the audience. This display is packed with excitement and surprises.... It's not to be missed!